To those who have ever read Lewis Carroll’s “Alice’s Adventures in Wonderland” can recall with quite fondness and curiosity the character of the Mad Hatter. In his book, and later in the Walt Disney cartoon, The Mad Hatter was portrayed as a lively, witty and quite entertaining individual. The inspiration behind the character, however, was not. Carroll as a child grew up in Stockport, a large city in the greater part of Manchester England. Here the business of hat making was a large industry. As we know the Mountain Men in Europe, as well as out in our part of the West, would trap beaver to send pelts back to these factories for hat making. Unlike the beaver muffs and coats, primarily used to keep one warm, the demand for a felt-like glossy hat, required for the use of mercury. Mercury, a metallic element, would cause the fibers of the fur to separate and mat easier, causing that timeless; shiny, durable AND waterproof hat that was so desired. Lewis Carroll no doubt must have seen a number of hat makers who suffered from the prolonged exposure to mercury. It would, in effect, cause the individual a neurological reaction confusing speech and sight. 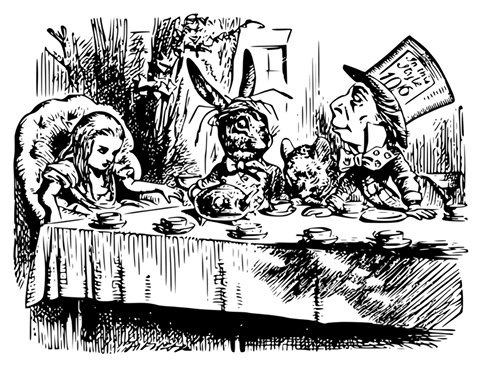 This probably inspired the author to create the character of the Mad Hatter, as everything in his novel was interesting and whimsical. I’m sure all of us can be grateful though, that the process of using mercury in hats is long outdated.